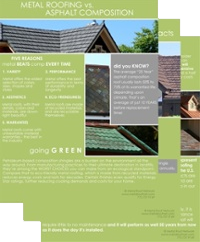 Metal Roof Network is a Reno, Nevada-based manufacturer and distributor of special metal roof materials. Our focus is on customized solutions to our clients’ needs, something we accomplish by focusing on the materials most suitable to the individual application. From our premium metals of copper, zinc, aluminum, and porcelain on steel to our value line of finished steel roofing systems, our selection and quality remain the best in the industry. All of our metal roofing materials are available in traditional vertical panels as well as beautiful and durable profiles like our custom diamond shingle, shakes, and tiles. With more than 40 years of experience specifying, designing, manufacturing and supply metal roofs, we have answers to the questions your project poses. We welcome the opportunity to help you find the perfect metal roof for your project, budget and design requirements. Contact us today. Metal Roof Network deserves a five-star rating. After contacting two other metal roofers, I became a bit frustrated at their tremendously high prices and seeming reluctance to help me with my project. The owner of Metal Roof Network, Chris Testa, called me back immediately. My project was a small one, but his enthusiasm and attention to detail made me feel like a very special client indeed! Chris has a good eye for design and he works with a number of talented fabricators and installers, so all I really had to do was describe my project and explain what I wanted the roof to look like. He was able to give several helpful suggestions and recommended a great installer. The roof and gutters came out beautifully and we receive so many compliments. Thanks!